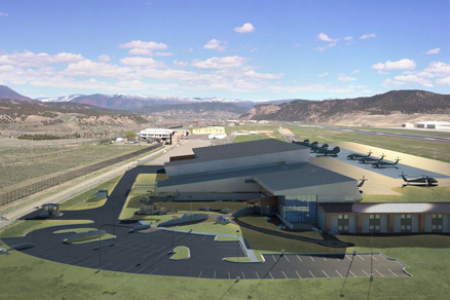 The HAATS (High Altitude Army Aviation Training Site) is located at the Eagle County Airport in Gypsum, Colorado. The 2-story facility was constructed with sustainability as a top priority, and as such, COARNG is pursuing a LEED Principal rating. The design incorporates water efficient landscaping, energy-efficient HVAC equipment, improved indoor environmental quality, energy efficient daylight, light harvesting and lighting controls, and local materials to name just a few. The facility is made of use zones. The two-story billeting area has 34 rooms with local laundry facilities on both floors. The administration area includes areas for classroom instruction, flight planning, equipment storage, physical fitness facilities, meeting rooms, offices, and a dining area. The large helicopter maintenance hangars are segregated between one being maintained as occupied space and the other as a minimally heated space to avoid freezing conditions for aircraft storage. In the hangar area are shops for aircraft repair and maintenance, electronics repairs, parts stores, and vehicle maintenance. E Cube provided extensive design assistance on a world-class helicopter maintenance facility. Our influence of the design included such areas as radiant heating and cooling of the hangar floor as well as energy recovery units for the hangar ventilation systems. These design recommendations were further enhanced by the use of large de-stratification fans to move high volumes of air at low velocities across the hangar floor to maximize the heating and cooling of the radiant system. These recommendations, by E Cube, furthered the Owner’s desire to reduce HVAC energy consumption, yet still maintain personnel comfort. E Cube Life Cycle Costing for the Thermal Solar and Geothermal systems.